Please be patient while I keep modifying this site. I am obviously a much better glass artist than a web designer. Thankfully these sites make even an idiot savante such as myself seem proficient in a totally foreign area. The contact button will lead you to me if you feel the need to add bees to your home. At the moment I'm just about ready to scream. This is my cool bee. For some stupid reason I can't figure out how to get text next to it. Things seem to plunk down willy nilly and won't move to where I want them. Hence the silent screaming, since I'm in the library. But I have loads of these to finish making so they'll bee under the tree for the holidays. We have bees that fly in your window or bees that stand on your shelf , and now bees that walk on the wall! 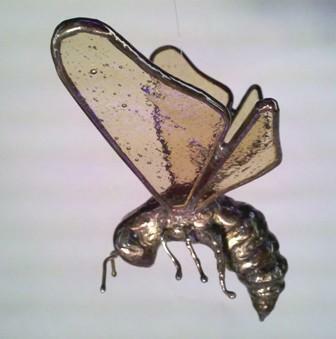 There are dark bees and light bees, and golden bees and iridized bees. And they all have a dab of pollen on their backs like they just came in from the field gathering nectar. They also all have stingers. But that's just because I'm a new beekeeper and I still don't trust them. Others have said that the stingers are not out and ready for action all the time, but I've been surprised a couple too many times to not think of them as all sweetness and light, I know they are weaponized. If you are here because you like bees and have bees, or if you are just interested in fabulous stained glass that emulates bees, I hope that you think these bees is cool. I have been doing stained glass for 20 odd years, with a slight hiatus performing soul sucking jobs for money. For some odd reason I decided that a hive of bees would be a grand idea to have on the porch in inner city Akron. Though, I must say, it does keep the transients from playing in my yard. And we are producing a fantastic tasting honey from heaven only knows where. At some point that will be offered here too, as well as beeswax candles, but for now the quantities are insufficient for widespread pimping. Though occasionally you can find me at the downtown Akron's Farmer's Market in the summer. If you live in Akron or thereabouts, we can meet somewheres and you can look at them closely before you pick a favorite. If you live too far for that but still need a bee, please pick one from the pages, or ask for new pictures or whatever styles you like. If I make one for you, I can send a picture for your approval before shipping. since I think I keep screwing up that damn facebook link. Go Ahead And Give Me A Piece Of Your Mind!